The rich aroma and distinct flavor of fresh coffee is one thing that many of us love. Whether it is to kick-start the morning or to re-energize you at any point of the day, there is nothing that a caffeine fix cannot solve. With this, there is no wonder why a lot of people consider a manual coffeemaker as an essential investment. Which is a better manual coffeemaker? In this AeroPress vs French Press article, we will help you to come up with the right decision. We will have a side-by-side comparison of two popular products, and in the end, will recommend which one is the better choice. In the table you can find below, we have quickly compared some of the features that you can find in the two manual coffeemakers that we are comparing in this article. In this section, we will go through some of the similarities between these two manual coffeemakers. One of the best things about AeroPress and French Press is that they can deliver multiple functionalities. While most of you would use it for making coffee, it can also deliver exceptional results for tea and espresso. Technically, you need 9-bar of pressure to make a legit espresso. Obviously, these two manual coffeemakers won’t be able to create such pressure. However, if all that you want is the flavor of espresso, both of the two products will be able to do so. Given the size and weight of the two manual coffeemakers, you will also love the fact that they are portable. Whether in the campsite or beach, among other places, you can easily bring them with you. There is no need for electricity to brew the perfect cup of your caffeine fix. Cleaning the two does not need to be a difficult task. They are both dishwasher-safe. The manufacturers recommend that you place them on the top shelf. To help you easily make the right choice, let us also take a look at how the two coffeemakers are different from each other. This is perhaps the biggest difference between the two, which is also the reason why they yield different results. In the case of AeroPress, first, you have to insert the filter on the bottom part of the chamber. Place it on the top of a cup. Fill it with coffee and hot water. Mix using the stirrer for about 30 seconds. Press the plunger down. Coffee will drip straight to the cup. From the methods discussed above, it is apparent that using an AeroPress will require more effort on your end. This can be troublesome to use for people who have shoulder issues. The French Press, on the other hand, is easier to push and will require almost no effort on your end. Although the AeroPress can make up to 3 cups at a time, it is designed specifically for personal use. This is as against the Kona French Press, which can brew up to 34 ounces, which is equivalent to up to 8 cups. The latter is the perfect choice if you want to brew more in a single press. It is also noticeable that there are differences in physical design, although both products are portable. AeroPress seems to be slimmer, which is basically because there is no handle. Kona French Press, on the other hand, comes with a plastic protective case that has a handle on the side. This makes it more resistant to thermal shock. Both of the coffeemakers are made from materials that can be exceptionally durable, although they are different. Aerobie AeroPress is made of polypropylene plastic, which is BPA-free and food-grade. Kona French Press, meanwhile, is made using borosilicate glass. To make it less prone to breakage, there is a protective case with handle. When it comes to filtering c﻿offee, Aerobie AeroPress seems to be doing it better. The paper micro-filter that is included is more effective in making sure that there are no grits in your coffee, resulting in a smoother drink. This is as against French Press wherein there is a possibility that coffee grounds will be left. If you are always in a hurry, the Aerobie AeroPress can prove to be the better option because it brews quickly, which will just be a minute and a half on average. With the Kona French Press, meanwhile, the steeping time is longer and brewing your coffee will take approximately five minutes. Both of these manual coffeemakers can deliver exceptional results, but your personal preferences will have an impact on which one could be better. In the case of AeroPress, the flavor of coffee will be rich. This is basically because of the unique extraction process. The coffee also tends to be cleaner. Thanks to its paper filter! The latter will make sure that there will be no grits left. Acidity and bitterness are minimal. On the other hand, with the Kona French Press, the flavor tends to be darker and fuller. It is also possible that you will end up with a muddy taste. There will also be grits in your coffee since the filtration is not as effective as the AeroPress. Coarse grind should be used for the best outcomes. From the parts and accessories that are mentioned above, it is apparent that the two are indeed different from each other in many ways. The biggest difference is the construction. The carafe for Kona French Press is borosilicate glass. For AeroPress, on the other hand, it is made from durable polypropylene plastic. Because glass is brittle and can be more prone to breakage compared to polypropylene, Kona integrated a protective case, which also comes with a handle. This protects the carafe, which is one thing that you cannot find in AeroPress. The construction of the presser is also different. The AeroPress comes with a plunger that has a rubber bottom. Meanwhile, in the case of Kona French Press, the presser is made from metal. Also, the Aerobie AeroPress comes with a carrying bag. This makes it easy to make sure that all parts are well-organized and you can easily bring them with you anywhere. Lastly, AeroPress comes with paper filters. When you purchase the product, you will also have filters that are good for one year of use. With French Press, meanwhile, there is a permanent metal mesh filter. In this AeroPress vs French Press post, we have compared two of the popular options for a manual coffeemaker. Choosing which one to buy is not an easy decision, especially because they have their respective benefits and drawbacks. Regardless of which one you pick, you can be assured of having great-tasting coffee that you can make on your own. 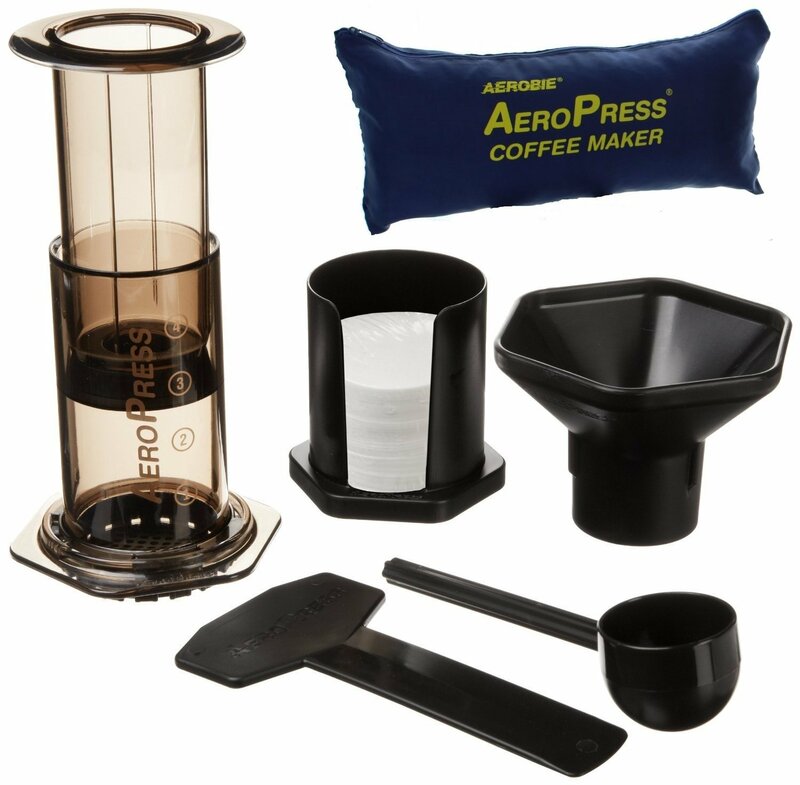 If you were to ask for my personal opinion, however, I would choose the Aerobie AeroPress over the Kona French Press. A lot may be discouraged over the fact that more effort will be required in using the AeroPress, but this should not be too much of an issue. The AeroPress is an excellent choice because of the quality of coffee that it can produce. It may not be as bold, but it is smooth and creamy. There are no grits because of the paper-micro-filter. 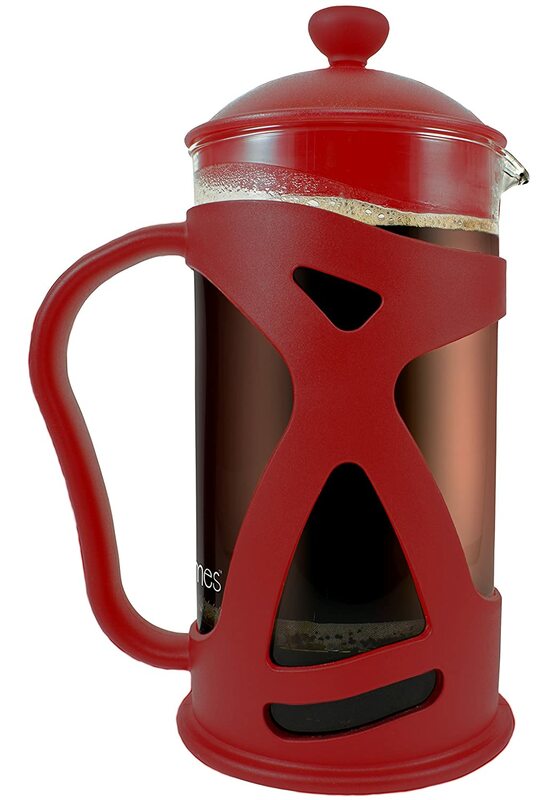 This is also perfect for people who are always in a hurry because brewing time will be shorter. In only about a minute and a half, your coffee will be ready. Of course, the Kona French Press also has its respective benefits, especially when it comes to its ability to brew up to 8 cups and the fact that minimal effort will be required. But taking all other things into account, I would still personally choose the Aerobie AeroPress.